So, you've got your mat and your block and maybe a couple other yoga things, but where do you start? What poses are good for beginners or someone that's never done a lick of yoga in their life? 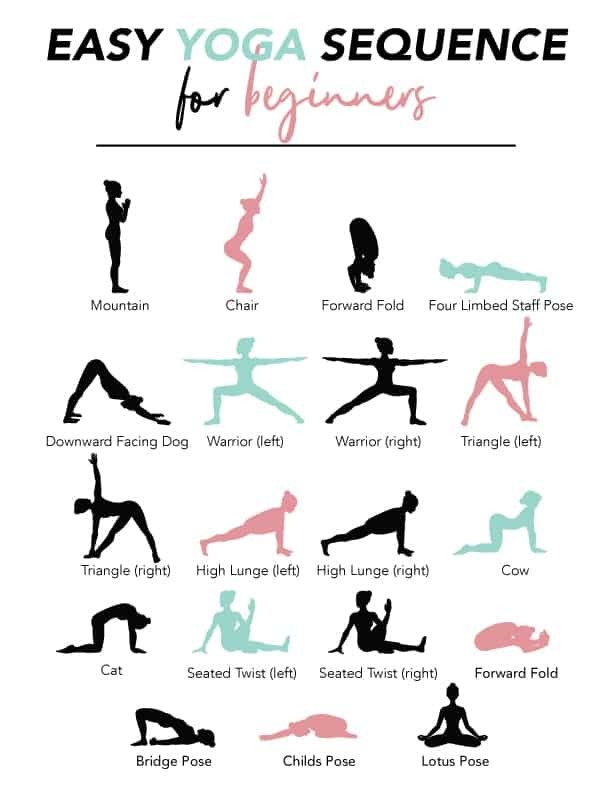 There are a lot of poses that are beginner friendly or at least something you can modify to be beginner friendly. You don't have to worry about crazy poses that look extremely complicated or something like you'd see a contortionist do at a circus show. Believe me, we all started with the basics and some of us still struggle with flexibility from time to time. If it's not flexibility it's strength that gets us. But, that's why they call it a yoga practice. We are forever practicing this amazing thing called yoga. And, this means that wherever you are no on your journey is just perfect. Here's a great way to practice all of these yoga poses. Just because you're just starting a yoga practice doesn't mean it's going to be super hard, but it's also not going to be easy. It's just like any other workout you do… in the beginning it's going to feel awkward. You won't know how to do certain poses or if you're even doing it right. It might feel like you're doing things wrong when you're actually doing them correctly. But, as you continue your practice you'll begin to notice changes. Your fingers might touch the ground a little easier or you might be able to put your hands flat on the ground in a forward fold. Each day things will get better, they'll get a little easier, and they'll start to be more fun. Slowly, you'll start getting creative on your mat. Yoga is like an expression of yourself. No one is the same, and no one really practices the same (unless you practice Ashtanga yoga… then it's the same thing every practice). Before we start, I just wanted to let you know that I created a graphic and put it at the end that gives you a little sequence you can go through to get started. Mountain Pose is one of the foundational poses in yoga. Nearly all yoga practices begin with Mountain Pose. It helps to build strength in the legs and also helps to calm the mind while you focus on your breathing. Stay in Mountain pose for a few breaths to focus and clear your mind before starting your practice. Note: This is probably the second hardest pose for me to take seriously (but it's a great yoga pose for beginners)… the other is Savasana (aka corpse pose… serioulsy.. you need to do this one.. it's another great yoga pose for beginners). Being still and focusing on my breath is something I work through on a daily basis. This pose is great for stretching your back and hamstrings. It also really releases tension in the lower back and hips. It's a lovely pose to come into when you're feeling particularly stressed or overwhelmed. Forward Fold Pose is also great for stimulating the intestines and helps improve digestion. I love slowly swaying back and forth in the pose as my hamstrings release so I can fold deeper. 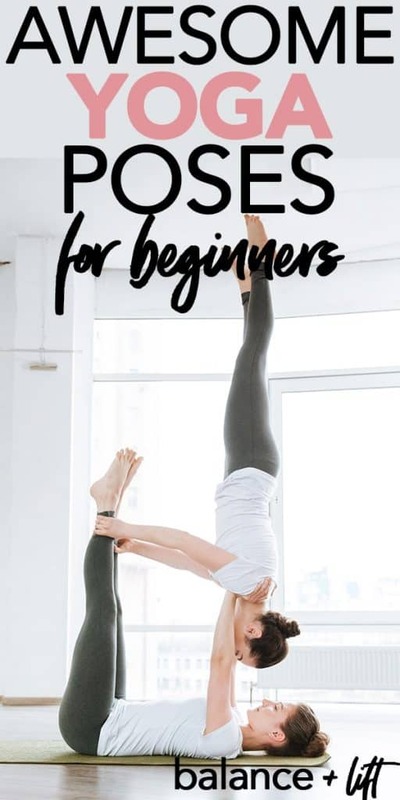 This one makes the “awesome yoga poses for beginners” list because it doesn't matter how flexible you are. You can fold forward and chill in this pose as your muscles start to stretch out. Chaturanga is a strength building pose and is great for building strength in the upper torso. It helps you prepare for moving into inversion poses by building your shoulder muscle strength. It also works on building your core strength which is amazing for spinal protection and proper posture. Don't slouch or sham out on this pose. It's amazing. In a lot of yoga classes, if you're feeling tired or are worn out, most teachers will have you go into Downward Facing Dog or Child's Pose usually. Both are considered a “resting pose,” but, honestly, I don't find this a very restful pose. My shoulders aren't really strong so holding the position can be difficult for me. Also, my heels don't quite touch the ground anymore (after taking a break from yoga you may notice you lose flexibility – don't worry it will come back if you take a break). But, it's great for building strength, resting and is a great transition pose between postures. You know the saying “a good stretch of the legs?” Yeah, Warrior 1 is basically that. It's a really good stretch of the legs. Warrior stretches the chest, shoulders and neck, belly, groin area. When done properly it strengthens the shoulders and arms, and the muscles of the back. And, it strengthens and stretches the thighs, calves, and ankles. Make sure to breathe deep when you get into this posture. It can challenge you mentally as your muscles start to feel like they're getting wobbly. Breathe through it and try to hold the posture for 5-10 breaths. When you're just starting a yoga practice or you've been doing yoga for a little bit, forward folds can feel really tough. It might seem like you'll never be able to touch your toes or fold forward gracefully like you see people do on Instagram. But, if you keep practicing you'll slowly get there. Soon enough you'll be able to fold flat onto your legs and wrap your hand around your wrist behind your feet. Seated Forward Fold helps to calm the brain and also helps to relieve stress. When practicing Seated Forward Fold it stretches the spine, shoulders, and hamstrings. And, since you're in a folded position it helps to improve digestion because you're compressing the digestive organs. It's said that traditional texts say that Seated Forward Fold can increase appetite, reduce obesity, and potentially cures diseases. Not sure if there's any evidence to that, but I find it interesting. This is hands down one of my favorite pose combinations. Being able to move slowly and deliberately from Cow to Cat Pose great when you have super tense back muscles or are having pains in your back. You can slowly roll from your shoulders to your hips and vice versa. It helps to alleviate stress and the movement also lubricates the spine. Here's a great post that talks specifically about Cat/Cow Pose. Are you looking to tone your abs and your botty at the same time? Well, Bridge Pose is one of those poses that can really help lift your botty for you (no pun intended there). When you're actively squeezing your glutes at the top of this pose it works them good. This pose stretches your neck as you lift your hips off the ground. It also strengthens your quadriceps and hamstrings as you're pushing your feet into the ground and contracting your leg muscles while you're living your hips as high into the air as you can. Give it a try. Do 3 sets of 5 Bridges and hold each Bridge pose for 5 breaths. Your booty will be burning. Triangle pose is a side bend and a half spinal twist pose. It helps to stretch many muscles all at once. You're stretching your inner thighs, lengthening up your side and keeping your torso as straight as possible without caving in. The twist comes from twisting your shoulder back so you can reach your arm to the sky and look towards your fingertips. This pose is great for someone wanting to lose weight as the twist action helps to “wring out” your intestines and help to improve digestion. It can feel kind of odd at first when you attempt to do Chair Pose. You might feel like it's a pointless pose, but the key is to make sure your feet are pressing all four corners into the ground and to be actively tensing the muscles in your thighs. This allows you to strengthen your leg muscles while working on balance. The deeper you sit back into chair pose the more challenging it is. It also helps to strengthen the muscles of the hips and lower back. Try to stay in Chair Pose for at least 5-10 breaths before moving on to your next pose. Crescent pose (or High Lunge Pose) is a heart opening pose. It helps promote flexibility and strength in the legs and abdomen. It also works on your stability because you're balancing on your back toes. But, as you reach your arms overhead it also stretches the front side of your body while toning the muscles. This pose is great for increasing stamina and lung capacity. But, be aware it can seem a bit rough. Just remember to breath deeply and you'll find that your stability and strength in this pose increases faster than you'd have thought. Whenever you're feeling constipated or if your period is causing you some heavy cramps, the seated twist is a great pose to practice. The easy twisting motion gently massages the abdominal section helping to relieve discomfort you may be having. It also helps with digestion if you're constipation is from intestinal issues. Practicing this pose is also great if you have a lower backache. The twisting motion helps to stretch the muscles of the lower back and you can feel the relief almost instantly. Try to hold this pose for 5-8 breaths on each side to reap the full benefits and really get a good stretch. Childs pose is such a great pose. It helps to relieve tension in the neck, the back, and the hips. It also gently stretching the hips, hamstrings, and ankles. This pose is great if you've had a particularly stressful day. Sink into Child's Pose and rest for about 5 minutes following your breathing as it flows in and out. Getting into lotus can be tricky especially if you aren't that flexible yet. Don't worry, it will come with time and soon you'll be able to get into full lotus easy peasy. This is a great pose for meditating and letting your body rest after a long, hard workout. It allows your breathing to settle and your body to process the practice you just completed. Try getting into lotus once a day and working on your flexibility for deeper versions of lotus. In the beginning, it can be rough getting on your mat every day. One thing I was told when I was first starting is that even if all you do is sit on your mat you're making progress. If you make it on your mat every day it's a good sign. You can always move around to see what feels good in your body. As you start moving you might be inspired to get a small practice in. Start off with a small sequence and build up as you feel more comfortable on your mat. The sequence I put together below is a great place to start your practice. 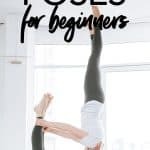 It includes poses that are great for beginners and not overly difficult. These things aren't necessary, but they really help out and come in handy when you're a beginner and even as an advanced yogi. Enter your email below to have a PDF version of this image emailed straight to your inbox!